Eric Ravilious died when his aircraft went missing off Iceland while he was making war paintings. An artist in multiple disciplines, his greater legacy dwells in water-colours. 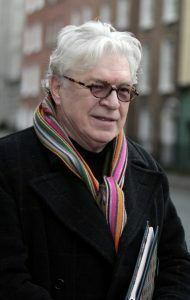 Frank Delaney re-visits the work of this understated, yet significant figure. In the early nineteen-eighties, for a commission about the sense of place in John Betjeman’s poetry, I worked with a photographer named James Ravilious. He lived in Devon, where he set forth every day to capture the profound countryside around him. His are the kind of photographs that Chaucer might have taken, monochrome and immortal. Distant windswept combes; gnarled trees; the square towers of village churches; beasts closer to the primitive earth than God – his work invites a leaning towards the word “timeless.” But James’s photographs are not timeless, and that was the first point of him – they are of their time and their time only; they are, indeed, what may be called, in the deepest sense, record. Second point: to the sense of Time add sense of Place – because neither could these photographs have been taken in any other country; put the words “English” and “quintessence” together and you get the idea. 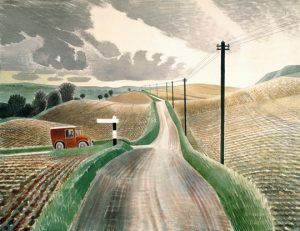 This unique confluence was, I now think, genetic; James was the son of the similarly unmistakable Eric Ravilious. Only Art controls Time. It can freeze it, pin its moment, accelerate it, ignore it, invent and re-invent it, spin it over, under, sideways, down. Consequently (imagination being truer than fact), our artists have become our best recorders of all our worlds. Time and Place are conjoined and frozen in the fullness of their reportage; we see how it was There and Then – in the house in Delft, where Vermeer’s girl reads her letter, or in the early twentieth-century Byleorussian village which Chagall showed from his most credible point of view, of the couple flying above it. The most touching are particular to their time and their place. Eric Ravilious likewise recorded England in that watchful, changeful moment between the world wars. He served both masters – his own time, in his own England. Indeed, he confirms Englishness in Art, where the power so often comes from restraint; the real stuff is beneath the surface. Given an already substantial body of work in his thirty-nine years – hundreds of wood engravings, close to 100 water colours alongside multiple other outputs – we can only imagine what he might have gone on to produce had the gods of war not been so hungry. 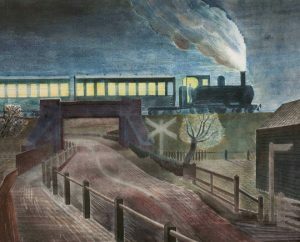 In the super-perceptive Ravilious there are no “gross and violent stimulants,” and without blinking he put up a surfeit, almost, of “beauty and dignity” – and yet he never sacrificed his own stern and often lonely edge. And he is so individual, so recognizable at first glance, so much his own man, because, though delighting in the Surrealists and the Chinese, he made his point without playing for any team. Not the Fauvists, not the Cubists nor the Dadaists nor the neo-Impressionists, he was also too subtle for the harsher, uber-Modernist school of his German contemporaries. Look, though, at his 1935 water-colour Train Going Over a Bridge at Night – he knew about those other fellows, and the wind that blew from their direction ruffled his hair, but he wasn’t like them. He was 33 when he painted it, and so mature. ‘Rav’ to many who knew him, ‘Boy’ to his pals who adored him and his cheerful ways, was born in Acton in 1903, the youngest of four births, one of whom had died in infancy. His parenting by a mercurial, bible-minded father and a more tranquil mother birthed the emotional range that can give an artist a useful swing. In his father’s early trade there’s an influence there for the taking – a drapery shop. It’s easy to see the modest sheens of Edwardian fabrics in Ravilious’s work. 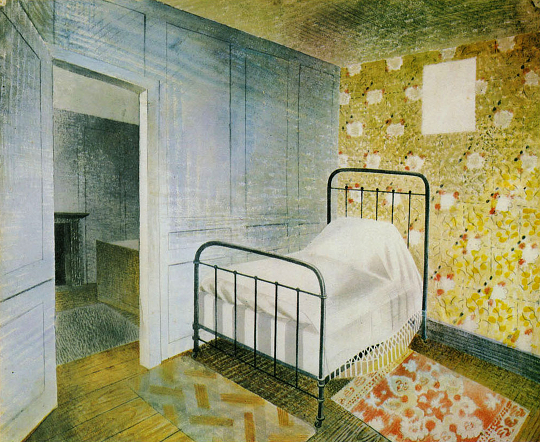 Indeed, once you know of his childhood among the swatches of cloth, it’s astonishing to note how often his use of stippling and cross-hatching echoes domestic patterns, e.g., The Bedstead, 1938. When Papa Ravilious’s fierce biblical vision failed to hold his finances steady, the family moved to Eastbourne. One of the French novelists (I think it was Mauriac) said, “the door slams shut on a writer at the age of twelve.” There’s enough evidence to suggest that Eric Ravilious saw much of what he would paint by then, not least the flat planes of the English Channel, and its cliffs and lighthouses, as in the 1939 piece, Beachy Head. In general, the trace elements in his geology shine up at us. At Eastbourne Grammar School when he was eleven, he made a drawing of his egg in its eggcup. The teacher gave him 8 out of 10. It merited a higher mark – that was a moment when his ability to create and hold an original line became apparent. Twenty years later, Wedgwood had him commissioned – vases, teacups, plates, the 1937 Coronation Mug of George VI and the gorgeous Boat Race Bowl. In 1919, aged sixteen, he gained a scholarship to the Eastbourne College of Art. Three years later he had another, to the relatively new and as yet unsung Royal College of Art. 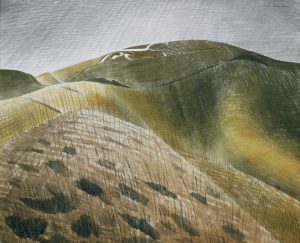 One day, through the door of his Chelsea classroom, walked the man who would help teach Eric Ravilious up into maturity, the much feistier, more damaged and brilliant Paul Nash. Not everybody, always and ever, worked in oils (Ravilious said it was like painting with toothpaste), but aren’t they essential when you’re reaching for sheer force? Maybe not: Nash had been invalided out of World War I, and although his body healed, his attitude bore scars that he believed we should all know about. And he displayed them – in scathing water-colours as lush and violent as rain forests. 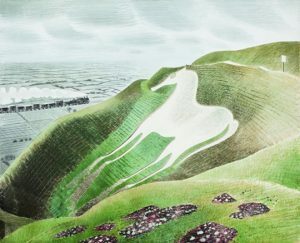 Nash saw Ravilious early and liked him, liked his range, his refusal to be trammelled by one medium. The similarities between the two would eventually be more suggested than striking. 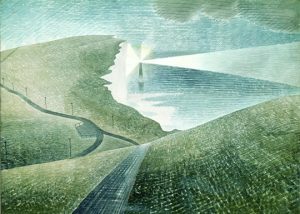 In Ravilious you can see some Nash, but it’s the intent without, so to speak, the cocaine, the energy without the driving pain. Nash introduced his likeable student to the Society of Wood Engravers, a place where one could show one’s work. This exposure – and Nash’s good word – got Ravilious early commissions for book plates, one of the great minor art forms of the period. Wood engraving has its own mystery: think of the language. Ravilious’s tools included a “scorper,” a “spitsticker,” a “graver” – a scorper is a small gouging-tool for hollowing and chasing wood – they use it to make bowls (from “scalper” or “scauper,” a surgeon’s scraping lance); a spitsticker is a tapering kind of triangular scalper, again for routing, and a “graver” (more obviously) carves or scrapes the wood; archers used it, and antique dentists scaled teeth with it. Ancient instruments – timeless results. His engraving output became a major part of his artistic and economic life. 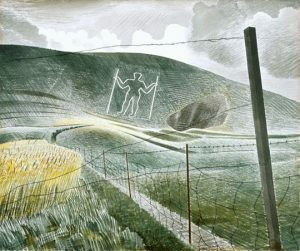 Ravilious seems to have grasped the single outstanding quality of the form; eternal and universal, it closes the gaps between cultures and centuries. The work he delivered, whether for the little private presses – or the larger commercial publishers – who just wanted to produce glorious books – could as easily have frontispieced Boccaccio or Malory. 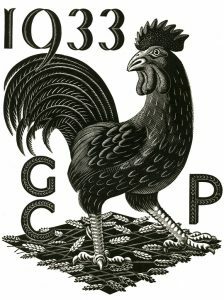 The 1933 work for the Golden Cockerel Press Prospectus shows Ravilious in full engraving form. While one of his students was observing him thus, another student married him, Tirzah Garwood. Long-shaped and grave, she had walked straight out of a Modigliani painting – and she too loved engraving. They wed in London on the 5th of July, 1930 and went to Cornwall on honeymoon with Charles, i.e., Tirzah’s dog. By now Rav was fairly motoring, with commissions for engravings, illustrations, murals, theatre designs, and recognition from those who knew people. With the presence of a wife, and thus a thoughtful and like-minded companion, he began to paint more and more. He painted Tirzah in multiple ways; she’s riding bicycles, walking village streets, playing the piano and memorably as one of the Two Women Sitting in a Garden, 1933. No major formal portrait of Tirzah by her husband exists that I’ve been able to find. Other than angled ciphers and dark, anonymous makeweights on a landscape, human beings never provided Ravilious with a major subject. 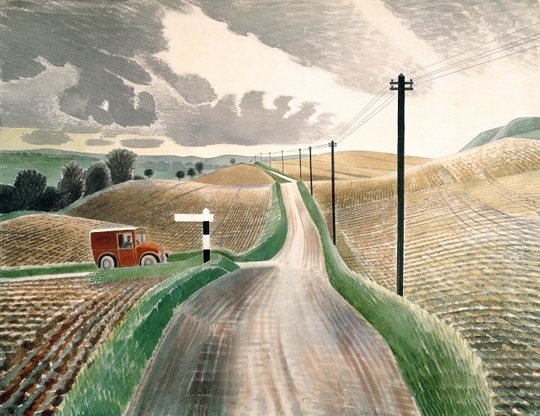 It was England who sat for him, in diverse poses, for a decade and more, and in his portraits of her, painted with deep and lasting love, reside his best work, such as Wiltshire Landscape, 1937. Ravilious’s choice of media must surely have delayed his fuller appreciation – he has been dismissed too often and too long as “minor.” It was understandable: with oils as king, wood engravings amounted to, at best, bookplates or colophons, and water-colours remained the premise of ladies in garden clubs; ceramics reached no farther than the domestic or memorial. It’s a shallow view. If technical requirement and skill arbitrated stature, Ravilious and the others along that bench – Reynolds Stone, John Piper, the Nash brothers – should in all justice be called “New” Masters. Wood engraving is powerfully demanding; ceramics too; and water-colours require the damndest fiddling and risk prevention. Ravilious, for instance, discovered that he could firm up control of the paint if he dampened the back of the paper. And his choice was shrewd unto his particular gifts; because he worked at great speed water colours gave him an advantage over oils – he could tear up a picture that wasn’t going his way. But – aren’t water colours “mild”? Not capable of being political? If you think that, why are Ravilious’s landscapes so empty of people? Could it be that he was also a chronicler of the flight from the land that denuded the English countryside – because livings were no longer to be made as of old? And yet his England goes back to darker Englands, such as the great chalk horse hillsides that he painted more than once. James Ravilious, my delightful one-time colleague, died in 1999, at the age of 60 – not as prematurely as his father but his death still makes me wince and turn aside in sadness. Working with him was a pleasure – and doubly so now, because without having known him I might never have come close to the joy of his father’s work, who perished off Iceland when James was only three years old. Retrospection decides how an artist can or ever will be considered. Writers, for instance, tend to stay in the shadows for a generation after death. Only when they climb out will the work be assessed and accurate reputation decided. One of the pleasing little miracles of this process is that, when all is said and done, the artist, in whatever medium, seems to settle in the most fitting place. 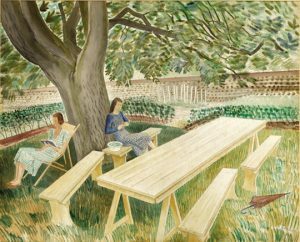 With Eric Ravilious now in the public domain, we can all stand back, fold our arms and look long and pleased at this gracious and talented artist. Originally published by The Public Domain Review under a Creative Commons Attribution-ShareAlike 3.0 license. This entry was posted in Art, Art History, History. Bookmark the permalink.